The creation of Tweed Volcano in Australia, and the subsequent erosion caldera. Australian volcano, Australian volcanoes, Volcanism (vulcanism) in Australia. Where have the Brisbane Metamorphics gone?! This content (book chapter "Records in the Rocks") is reproduced here by Big Volcano with permission of the publishers - Kingsclear Books, from the book "Bushwalking in the Mount Warning Region", by Rob Blanch and Vince Kean. Please note that some illustrations in the book from this chapter haven't been included. Publishers notice: This book is © copyright. Apart from fair dealing for the purpose of private study, research, criticism or review, as permitted under the Copyright Act, no part may be reproduced by any process without written permission. Enquiries should be made to the publisher. The Tweed is an area of rugged terrain, large local relief and spectacular scenery. 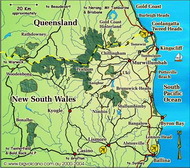 The area is dominated by a huge erosion caldera, the Tweed Valley, and remnants of the shield over 1000m. in altitude produced by a large and complex volcano centred on Mt Warning. This high land has not been cleared or developed for commercial purposes and contains the remnants of the natural ecosystems of the Tweed which are the setting for most of the bushwalks described in this book. A volcano of this size has extremely complex geology so the following description is of necessity highly generalised and aims to give a relatively simple basis of understanding for the interested bushwalker. Some knowledge of the rocks of the basin is therefore necessary for an understanding of the geology of the Tweed region. The volcano poured lava on to an ancient land surface composed of part of the eastern edge of the Clarence Moreton Basin. Over 20 million years have elapsed since the cessation of volcanic activity and erosion has cut right through the shield in places, exposing the older rocks of this basin. The Clarence Moreton Basin is a long trough with a north south axis extending from north of Brisbane to south of Grafton in New South Wales. This trough consists of metamorphic and sedimentary rocks. The oldest layers of rocks are the Brisbane Metamorphics Series which are approximately 250 to 500 million years old and outcrop on the eastern section of the Tweed Valley. The greywackes and phyllites occurring in this series of rocks can be seen outcropping in the headlands from Cabarita to Byron Bay. They also occur extensively in the Condong and Burringbar Ranges and on the lower hill slopes in the Tweed Valley east of Mt Warning, including the hills of Murwillumbah. Fig. 9 Simplified geological cross-section of the Tweed Valley from west to east. When these rocks weather they form heavy red to yellow clay soils. The yellow earths are highly acid and support mainly eucalypt forest although patches of rainforest can be found in gullies or on sheltered southerly slopes. The phyllites have been extensively used in the valley for road-base materials and can be easily seen in the quarries around Murwillumbah. Sedimentary rocks were laid down in the basin approximately 135 to 200 million years ago. Some of these can be found on the valley floor and the lower slopes west of Mt Warning. These rocks include the Bundamba Group, Walloon coal measures and Kangaroo Creek sandstones comprising claystones, sandstones, and narrow coal seams. The abandoned coal mine at Pumpenbil was a power source for the Murwillumbah Power Station formerly located on the site of the present Civic Centre. Some sandstones can be seen in road cuttings in the foothills, for example along the Numinbah Road. The sedimentary rocks also weather down into a highly acid podzolic soil that is somewhat sandier and poorer than the yellow earths. These soils mainly support eucalypt forests of which Mebbin State Forest is the largest remaining stand. The metamorphic and sedimentary rocks of the Clarence Moreton Basin were separated by a thin and ancient band of volcanic rocks known as the 'Chillingham volcanics'. These rocks are highly weathered tuffs and rhyolites approximately 200 million years old and like the previously mentioned rocks in the basin dip westerly at an angle of approximately 45º. The Chillingham volcanics outcrop in a thin north south line interrupted by the Mt Warning extrusion and can be seen in the hills of the Chillingham area. Approximately 23 million years ago, Mt Warning erupted and over a period of about 3 million years built up into a large and complex central volcano. A volcano of this size is created by many separate eruptions, punctuated by long periods of inactivity. Most of the volcanic material was extruded from a central vent located at Mt Warning, but several subsidiary vents also poured out lava at various times. These eruptions are best described in three phases, an initial extrusion of basalt, followed by a more explosive phase where acid material, mainly rhyolites, were thrown out, and a final quieter extrusion of basalt. The first group of lavas have been called the 'Lismore basalts'. This series of lava flows travelled a considerable distance and covered a large area, extending from the Lismore district in the south to the Beechmont district in the north. The east west spread of the lava was not as great, as it flowed more easily along than across the basin, but the Lismore basalts are present in the Tweed Heads and Kyogle districts. Many separate flows occurred and the long intervals between the flows allowed the development of a weathered soil profile. Evidence of the separate flows can be distinctly seen in the terraced landforms resulting from the erosion of these soil profiles. The best examples of these terraces can be seen on the middle slopes on the southern side of Springbrook clearly visible from the Numinbah tick gate. Lismore basalts are present as caps on the low hills (approximately 100 metres altitude) to the east such as Cudgen, Duranbah, Banora Point, Terranora, and Tomewin. It is also visible at sea level at Pt Danger, Fingal Head, Cudgen Headland, and Cook Island. Lismore basalts form the middle slope above the sedimentaries but below the cliffs on the Springbrook, Lamington, and Nightcap plateaux. Basalts weather down into relatively neutral and highly fertile red loamy soils called 'krasnozems'. The basalt soils supported huge stands of subtropical rainforest, known locally as the 'Big Scrub', which included many fine stands of red cedar. The volcano then became more violent and acid rocks were extruded, sometimes explosively, from the vents. Rhyolites, volcanic 'glass', agglomerates and tuffs were included in this group. The rhyolites are particularly resistant to erosion in this environment and can be seen as the cliffs on the high plateaux forming the western half of the caldera rim. Deep gorges have been worn in the rhyolites, particularly by the streams that flow into the Richmond Valley and into Queensland. Spectacular waterfalls can be found at the heads of these gorges where the streams plunge in the vicinity of 120 metres over the rhyolite cliffs. Imposing examples of these falls can be seen at Purlingbrook, Minyon and Tuntable. Interesting rock overhangs sometimes called caves Bushrangers Caves at the head of the Numinbah Valley are perhaps the best example of this phenomenon. The final phase of volcanic activity was a relatively quiet series of basaltic lava flows. The rocks extruded during this period of activity have been called Blue Knob basalts and form a capping on the high plateaux of Springbrook, Lamington, the Tweed Range, and the Nightcap Range. Like the Lismore basalts on the lower slopes these rocks weather to fertile red soils that support dense stands of subtropical rainforest. Small relic patches of temperate rainforest exist on some of the higher peaks, and contain some of the northernmost examples of the Antarctic beech, usually found from Barrington to the McPherson Ranges. These trees are among the most fascinating in the world. Their name comes from one of the three main groups of Australian flora, the Southern or Antarctic group. The Lamington area is perhaps the most northern occurrence of the Antarctic beech in the world. Twenty million years of erosion has considerably altered the shape of the huge dome-shaped shield formed by the volcano. At first streams drained downslope, outwards from the top of the shield forming a radial pattern like the spokes in a wheel (see Figs 5 & 6). These streams gradually eroded valleys and deepened them with the passage of time. They soon cut through the Blue Knob basalts and began forming gorges and associated waterfalls in the rhyolites. Two streams that drained directly into the rivers on the floor of the existing valleys in the Clarence Moreton Basin, the Richmond and Nerang, cut down more rapidly because of their steeper gradients. These large valleys now separate the three plateaux bounded by rhyolite cliffs, and have become important transport lines in the area. However the stream that cut most quickly into the shield was the Tweed River, mainly because it drained directly to the sea and therefore had the steepest gradient. In the process of doing this the Tweed 'pirated' some of the headwaters of the streams flowing to the north, west and south, and carved out the present-day erosion caldera, the Tweed Valley. It also exposed the plug or neck of the central vent, Mt Warning, and a series of ring dykes surrounding the plug. This ring dyke forms a chain of lower mountains surrounding Mt Warning and includes Mt Uki, the Sisters, and Brummies Lookout. It has also exposed part of the magma chamber composed of diorite, sometimes defined as micro-granite, which can be seen as rounded boulders or 'tors' on the lower slopes of Mt Nullum beside the Uki Road. Some secondary vents and dykes have also been exposed by erosion. These include the Doon Doon Doughboy, Dinseys Rock, Egg Rock, and The Pinnacle. The removal of large quantities of rock by erosion of the shield has resulted in a series of small rises in the land surface in relation to sea level as the Earth's crust has adjusted to the lighter load. This has caused the streams to cut deeper into the valleys resulting in a series of low river terraces in the upper parts of the Tweed Valley. One of these terraces is clearly visible in the Dungay area. The post-glacial rise in sea level resulted in the drowning of the lower part of the Tweed Valley, creating a ria similar to Sydney harbour. This part of the valley has been silted up forming a remarkably flat valley floor with numerous swamps. The flats extend upstream to Boat Harbour on the Rous River and to Byangum on the Tweed. This section of the river is tidal and has a muddy bottom in contrast to the rocky tracts upstream. The flats are also characterised by numerous swamps and an absence of river terraces. This relatively simple account of the geological formation of present-day Tweed scenery gives some insight into the the great length of time involved and the complexity of the processes operating. It is this complexity that has made the scenery in the Tweed Valley unique in Australia, contrasting with the flat and relatively drab appearance of much of the rest of the continent. The size and stage of dissection of the caldera make it unique in the world, and the magnificent scenery compares favourably with more fashionable world tourist spots. Published with permission. © Part One - Natural Environment, chapter 2: Records in the rocks - Bushwalking in North-East New South Wales: Rob Blanch and Vince Kean, Atrand Pty Ltd 1989, ISBN 0 908272 24 3. Reprinted as "Bushwalking in the Mount Warning Region" published by Kingsclear Books Tel. (02) 9557 4367. The book is still available at some local Visitor Information Centres and Environment Centres.